It may seem like a super-mundane task, but washing your scrubs is actually a very important part of reducing the spread of infections at work. Since scrubs get so much more wear and tear than average clothes — and because they’re employed in environments where germs run rampant — they need the occasional special cleaning. For the most neat and professional look, make sure that your labcoats stay crisp and your scrubs stay true to their color with a little TLC. By taking the best possible care of your scrubs, you can be sure these garments will be with you for years to come, no matter how much stress and sweat they endure. Washing your scrubs doesn’t need to be a chore — we know how busy you are. Once you get used to a few small tweaks, washing your scrubs will be as natural as washing your day-to-day clothing. Before getting started, let’s cover the don’ts of medical uniform care. There are exceptions to each rule if you’re dealing with specific types of tough stains. DON'T wash your scrubs with the rest of your clothing. Your scrubs won’t contaminate your clothes once they’re clean, but it’s best to store and wash dirty scrubs separately. DON’T use extra disinfectants (most of the time). 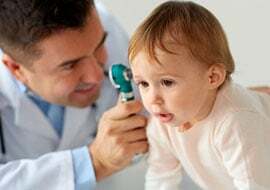 You won’t need extra disinfectant for your scrubs unless someone in your household is immunocompromised. Keep in mind that oxygen-based bleaches like Oxiclean, Clorox 2 and OXO Brite do not provide extra disinfectant qualities when used in the home laundry process. 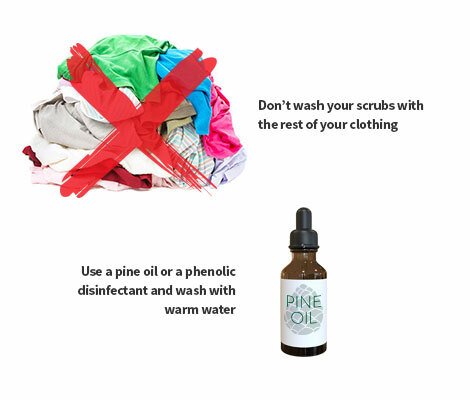 If you do need a disinfectant, use a pine oil or a phenolic disinfectant and wash with warm water. DON’T use bleach on lab coats. While you may want to use a bleach pen to deal with tough stains, don’t bleach your whole lab coat. Bleach will turn your lab coat buttons yellow and fade custom logos. It’s also unnecessary in most cases. You don’t bleach your hands between patients, so why use unnecessary harsh chemicals on your clothes? Skipping those common mistakes will help keep your scrubs vibrant, clean and long-lasting. So now that you know what not to do, let’s cover some tried-and-true scrub-washing best practices. Following these eight steps will keep your scrubs and lab coats in tip-top shape. Start out with high quality scrubs to ensure the best color, fit and fabric from the start. Use half a cup of vinegar with your first wash. This will help set the color of your new scrubs. Add half a cup of distilled white vinegar to the rinse water of your first wash.
Wash your scrubs immediately after work or store them separately from the rest of your clothing. This will reduce any transmission of microbes or fluids after your shift. Tackle any tough stains before washing. You’ll have better luck dealing with certain stains before the regular wash cycle. Check out our tough stain guide below for more help. Use gloves. 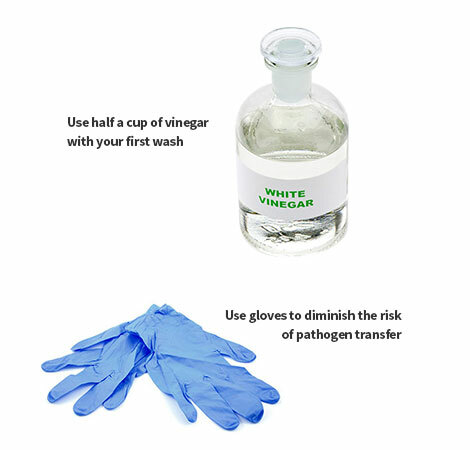 Diminish the risk of pathogen transfer by using disposable gloves when handling your dirty scrubs. Turn your scrubs inside out. This will prevent abrasion and pilling. This is especially important for scrubs with custom embroidery. Inspect your scrubs for stains before they go into the dryer. The heat will “set” any stains into your scrubs if you don’t get the stains out first. Dry scrubs on high heat. Contrary to what most people think, it’s not the washer that kills germs, it’s the dryer. Use a high heat setting for at least 28 minutes to eliminate potentially harmful microorganisms. What About Tough Stains on Medical Uniforms? Unlike the clothes you wear off the clock, your scrubs are likely to come into contact with all sorts of interesting stains. Here’s the quick-and-dirty on how to spot clean some common scrub stains. Be sure to always start by scraping off any solid residue with a tongue depressor, spoon or knife. Don’t use a cloth as this could press stains further into the fabric. Ointment: Oil-based stains need warm to hot water. 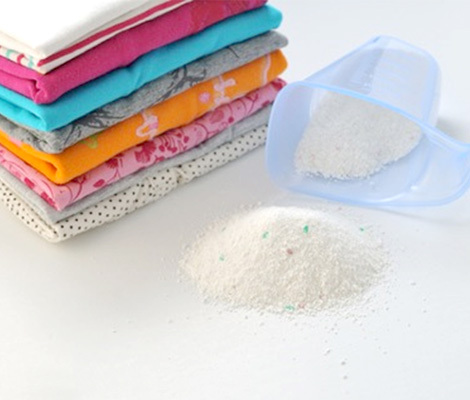 Apply heavy duty detergent like Tide and soak for five to 10 minutes. Finish by washing in hot water. Blood: Soak first in cold water, then use a steady stream of cold water to flush any particles from the fabric. Avoid hot water, which will set the stain. Next, rub in a heavy-duty detergent and let sit for five to 10 minutes before washing. Liquid Medication: Many medications have dye added to them. Use an oxygen-based bleach and cold water and soak for one to eight hours, then wash normally. Vomit, Urine and Feces: These stains are protein-based and should be treated with cold water. Flush with cold water and heavy detergent, then add a half cup of baking soda to washing water. Iodine: Soak iodine stains in warm water with a heavy-duty detergent for about 20 minutes, then wash as normal. Avoid common mistakes when washing medical uniforms, and you’ll extend the life of your scrubs and lab coats. 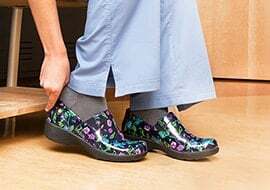 Tackling tough stains the right way — using these tips — will ensure that your scrubs and lab coats stay crisp and colorful, no matter how many shifts they endure!